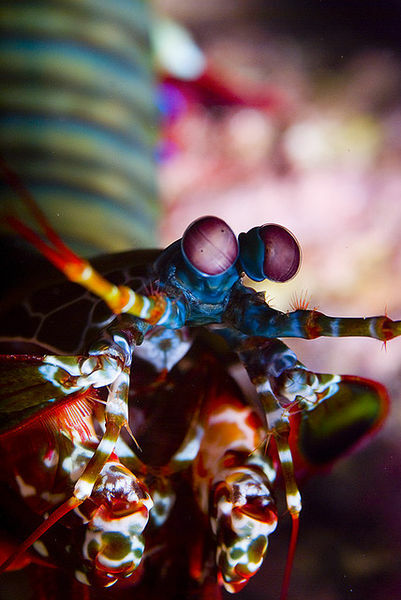 I am writing this intending to introduce you to the world of Mantis shrimps. First check out this cool Oatmeal comic on Mantis shrimps. The fact is that they are neither Mantises nor shrimps, and the colloquial name is a misnomer, but they belong to Order Stomatopoda of the Crustaceans. Now these animals are spectacularly aggressive hunters with some incredible cool tricks up their sleeve.They tend to stay hidden in narrow passages and burrows et cetera from which they operate as hunters that can actively chase and kill prey. There are various biological features that make these organisms fantastic hunters, including a superb visual system. These eyes can move independent of each other, they can perceive a wide range of wavelengths, ordinary as well as polarized light. The midband, which contains six rows or so of ommatidia, has receptors of upto 16 different types, this far outstrips the range of colour perception and discrimination that is available to humans. Apparently this includes up to 12 different types of colour receptors and 4 involved in the detection of polarized light. Please see this paper for more information on some of this photoreceptorial complexity. The really beautiful thing about each eye being divided into three units is that each eye is capable of depth perception and stereoscopic vision, which is required for visual information processing during hunting. A lot of this processing appears to be parallel, that is, several kinds of nervous output are streamlined before being sent to the Central Nervous System, things like perception of distance boil down to an overlap in the fields of vision based on distance, which means that distance to an object can be determined by which pair of receptors in the retina the point being tracked converges on to. Of course, what use is a sniper without his rifle? 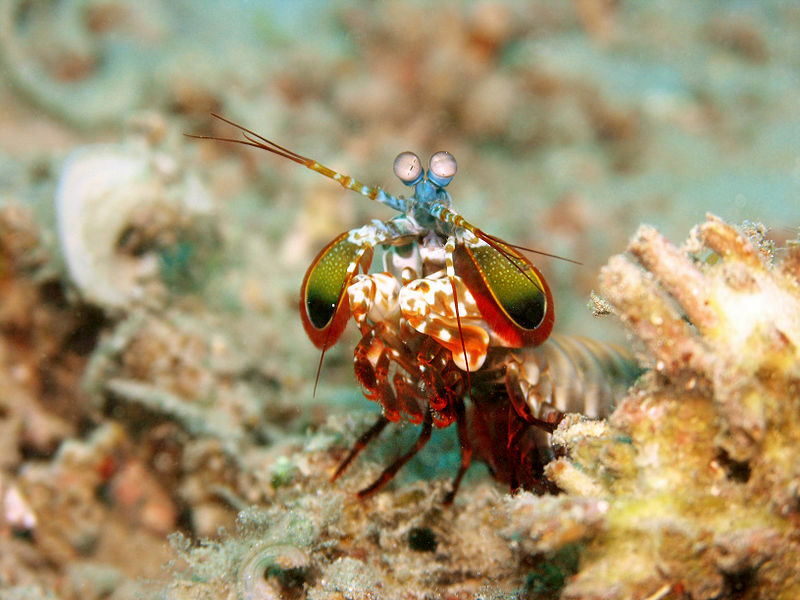 Mantis shrimps are fantastic predators due to the hunting mechanisms they have evolved to use. Broadly speaking they can be grouped as smashers and spearers, based on the types of Raptorial appendages that they have (this is where the name “Mantis” comes from. ‘Mantis’ is a Greek word meaning prophet and with their appendages they probably looked like they were praying). Some have sharp, spear shaped appendages, and are called spearers, and others have fat clublike appendages, and may be colloquially called smashers. The different weapons they have at their disposal may be reflected in their choice of prey, with the former showing a preference for soft-bodied prey and the latter targeting shellfish et cetera with harder shells. 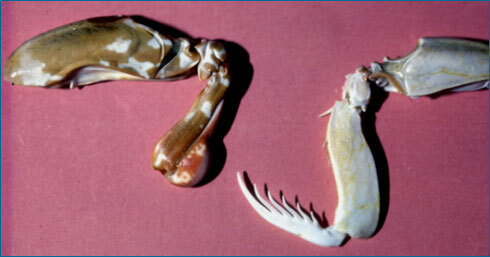 These appendages are compressed and then allowed to swing out at speed, sort of like a catapult with no projectile at the end, and it is this that does damage to prey, some of the details of Clubbed stomatopods lashing out are mind-boggling. 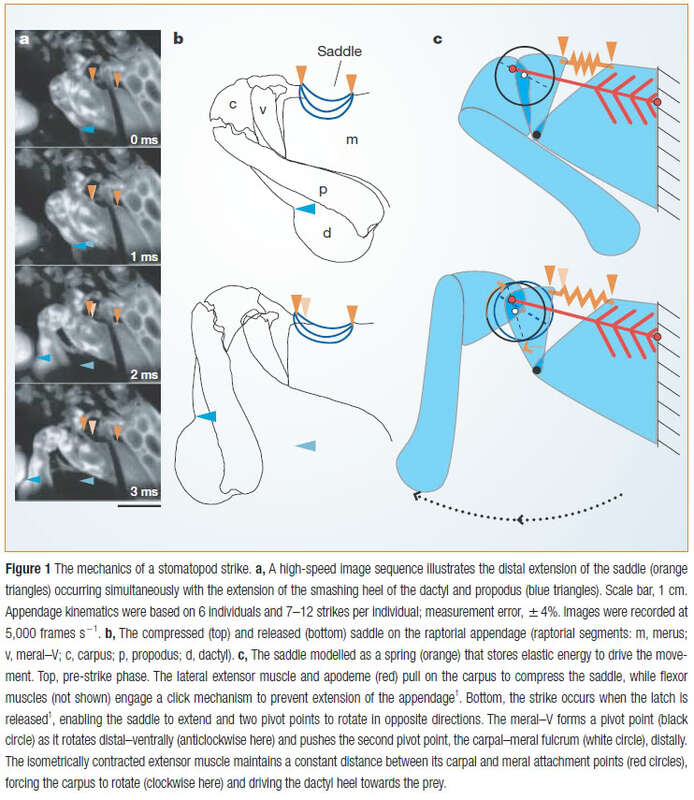 The authors also write in that paper that the dactyl heel (the tip of the club) can go up to a peak speed of 23 m/s and peak acceleration of 104 km/seconds squared, that is seriously bloody quick, to the point of potentially being more than a .22 caliber bullet. When the tip of the club is moving at a very high velocity, it builds up enormous amounts of kinetic energy, and this is what allows the raptorial appendage to do things like crack shells open. The impact force of the appendage on the target can be as much as 1500 Newtons.That can be insanely damaging. This also has a secondary knock-on effect, resulting in compression of the water/air in front leading to the formation of bubbles that then may collapse, this effect is called cavitation. This can produce heat and light, as you will see later. If you want to read more on this you may find the apposite paper here. To put things into perspective, the authors point out that a 2.7 mm cavitation bubble can produce 9 megapascals of pressure, which is the atmospheric pressure on Venus that is apparently enough to wreck rapidly rotating boat propellers. Now the really interesting thing about cavitation effects is that there is a shrimp, called the pistol shrimp, which snaps its claw to produce cavitation bubbles that then go on to injure and stun prey, which would be indicative of the fact that this mechanism could be damaging even when used alone. 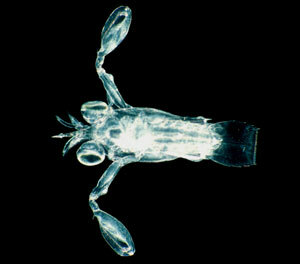 Mix in the smashing appendages of Stomatopods and you have a truly deadly combination. I suggest you read the paper because they had these Stomatopods strike a steel surface to collect experimental data, and in my opinion that is the best feature of science…collecting actual data to find out how things work as opposed to defining ill conceived answers from thin air. Now here is a demonstration of a stomatopod obliterating something and bringing its appendages into action, in beautiful detail, made possible by slow motion photography. You can also watch a TED Talk on Dr.Patek’s work. Image Credit – Roy L. Caldwell, Department of Integrative Biology, University of California, Berkeley. Image retrieved from Wikimedia Commons under a Creative Commons Share-Alike-Attributions license. I hope you have fun/had fun/will continue to have fun learning about these awesome predators. Good one. It certainly was fun to read. Please post more of these articles. What the hell is a nirmukta?